The Kasco Pond Circulator / De-Icers offer excellent performance across a wide range of depths and are compatible with all relatively shallow water depths of 2½' or greater. The circulator/de-icer's included horizontal float accommodates motor mounting on one of five positions for water movement to depth of up to 18 feet. The effectiveness of the Kasco Pond Circulator and Pond De-Icer largely depends on the depth of the surrounding water, obstructions in the water, and the geographic location of the installation. The pond circulators work by moving warm bottom water that is heated by the earth to the surface. The shallower the water in the area surrounding the Pond De-Icer, the less warm water there is available. It is recommended that the circulator is 2.5' to 5' below the water surface. Obstructions in the water such as floats on docks, large trees in the water, boats, etc. may restrict the flow of water causing a smaller area of influence around the Pond De-Icer. Your geographic location will also play a major role in the effectiveness of your Kasco Pond De-Icer. The longer and colder the winter is, the more the water will cool over time and open water may be limited accordingly. Other factors that may effect open water areas are bottom contour, salt content, mounting, etc. 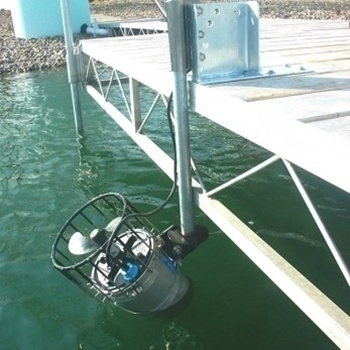 The Dock Mount is ideal for the rigors of industrial or manufacturing processes such as oil fracking and dredging barges, security barriers, hydroelectric power generation, dams and locks, and lift gates. Mount only Aerator sold separate. Prevent winter kills by keeping an area open for oxygen transfer. Protect docks and boats from ice damage in the winter months. Extend waterfowl hunting in the north by keeping areas ice free. Can control specific undesirable plants including algae. Special dock mount is optional. De-gases in recirculation systems as well as incoming water supply. Ideal for supplemental or continuous aeration. Includes flotation kit and two 50' braided nylon mooring ropes. Minimum Water Depth: 2 1/2"